Life’s a real beach when you’re a baby. So what better way to celebrate a milestone first birthday than with a most bodacious beach party! 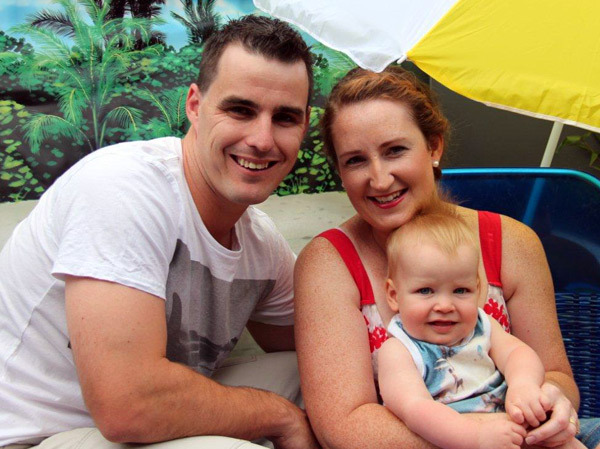 Mum-of-two Belinda and her family may live almost three hours’ drive from the coast but you’d never know it. They turned the backyard of their home all the way inland in central Victoria into a makeshift beach complete with tropical backdrops, retro beach umbrellas and – thank you kindly Ms Nature – plenty of sunshine. We like the thinking behind Belinda’s choice of party theme. 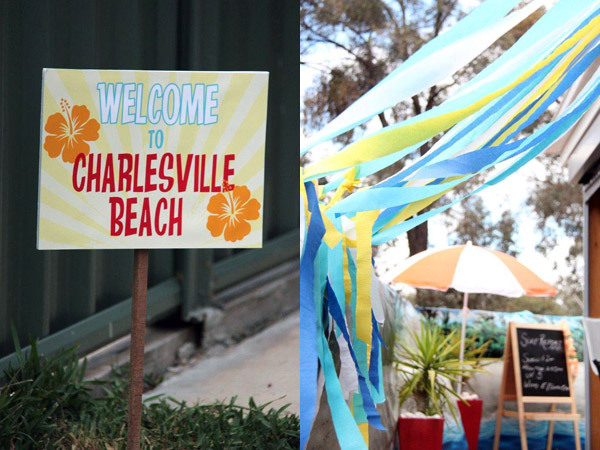 With a birthday slap-bang in the middle of an Aussie summer, she figured a beach party would allow plenty of water games to keep little guests cool should the weather throw up a scorcher. 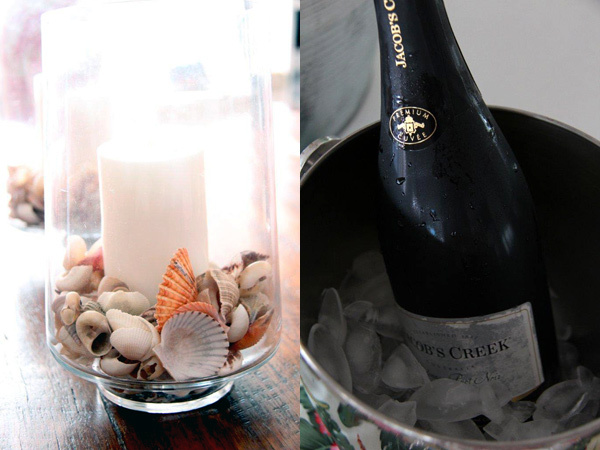 Here’s a lovely idea. 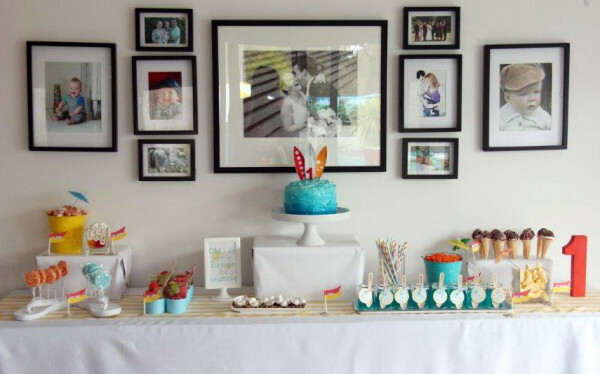 Belinda, an interior designer of children’s rooms by day, framed her orange and aqua accented sweets table with family portraits that tell the story of their journey from newly-weds to parents of two strapping boys. She had intended to make a bright and cheery backdrop of Brighton Beach-style bathing boxes, but we’re rather glad that time got away from her, as there’s something intrinsically special about the delicate poignancy of the photo wall. 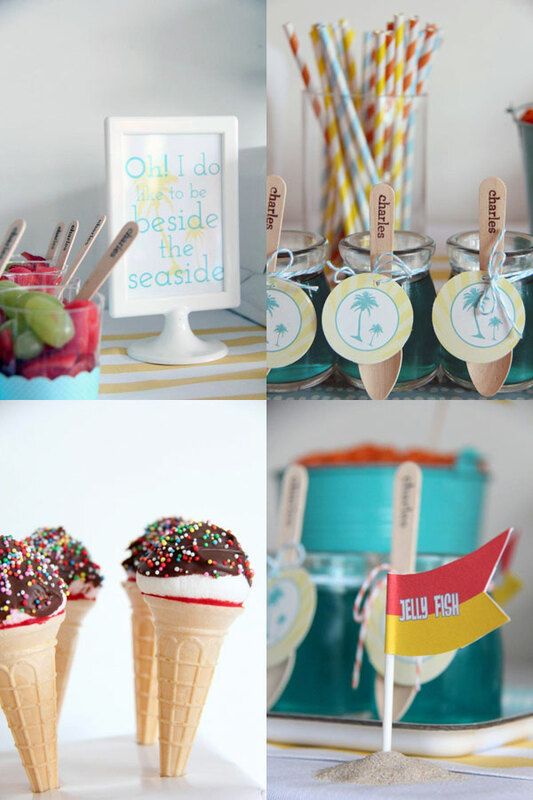 Besides, the dessert table itself certainly flies the flag for the beach theme, with sweets that pay a cheeky and cheerful salute to Aussie beach culture. 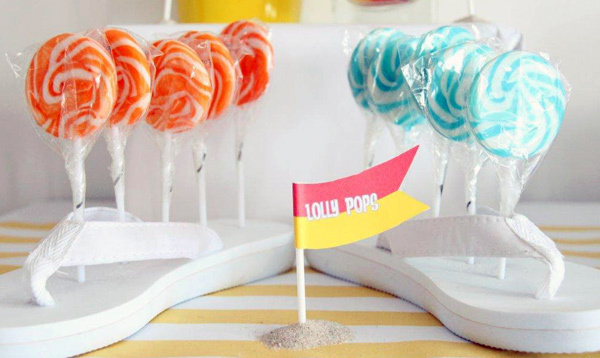 Check the surf lifesaving flags for food labels and the pair of thongs anchoring the giant lollipops! Perfectly matched to the party colours, they came from The Little Big Company, along with the similarly coloured paper straws. 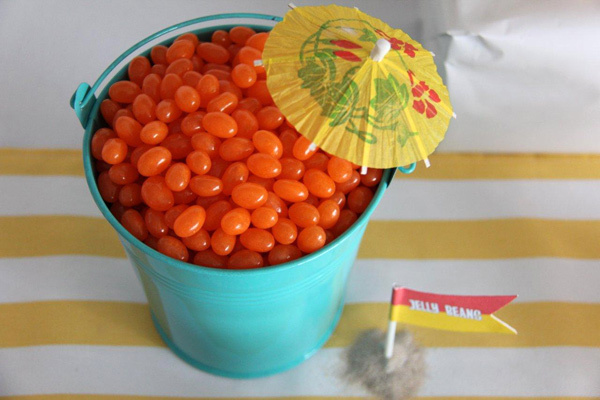 Guests nibbled on themed lollies too, including orange jellybeans, icecreams and – of course – lifesavers. 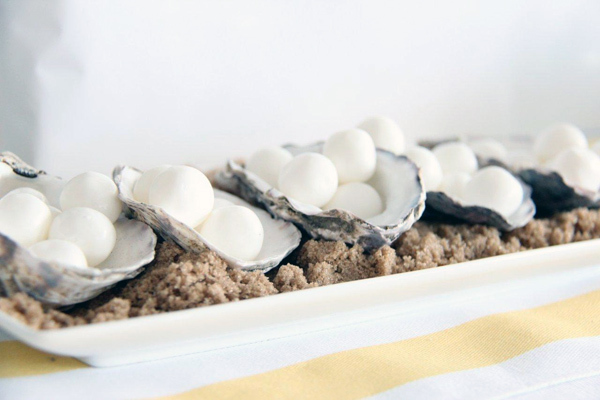 We’re also digging Belinda’s marshmallow choc-tops and Kool Mint ‘pearls’, presented in oyster shells on a bed of brown sugar sand. Clever! Personalised bamboo cutlery (made using a custom-made stamp from Sydney-based Sweet Style) dressed up the blue jellies and fruit cups, added as an antidote to all that sugar. The cutlery and the pretty glass jelly cups were other Sweet Style finds. And I wanted to especially point out the fish-shaped ice that Belinda went to so much trouble to make to keep the bubbly cold for the grown-ups. She tells us no-one even noticed. Isn’t that always the way! 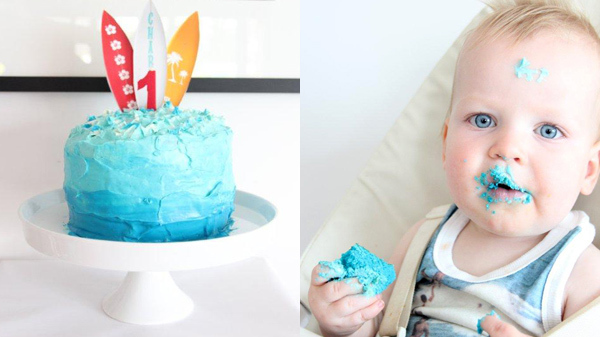 Now let’s give three cheers to the birthday boy, dressed in a suitable beachy Rock Your Baby singlet, as he tucks into his home-baked cake. Belinda also made the natty surfboards on top. Here he is again sans all that icing with his doting dad Matt and party maker extraordinaire of a mum, Belinda. Want to share your child’s wow-worthy party with us? Then just fill in this form on our contact us page. While we can’t reply to every email, we’ll certainly let you know if your party is chosen to be showcased on Babyology. We can’t wait to hear from you and look forward to seeing your amazing parties!